Come spend whole Saturday with your family at Arts in the City, Bonifacio Global City to witness LBC Foundation & WWF’s “Beyond Earth Hour - I Will If You Will” Campaign Launch Program & Turn Over Ceremony. Donation of Project Rainbow Waste Segregation Bins to 7 Cities' LGU's will officially commence on the same day. Earthdance is a global festival aligned with the International Day of Peace, held in 500 locations and 80 countries around the world, including the Philippines. It has become the largest Dance and Peace event in the world since its inception in 1997. Earthdance is an international network of communities, empowering international event producers to connect with the global movement. Thousands of people participating in hundreds of events and gatherings worldwide connect globally and act locally to benefit local charities and deliver real solutions for peace, sustainability, environmental awareness and social justice. Worldwide participants join together for one powerful, coherent peaceful intention. 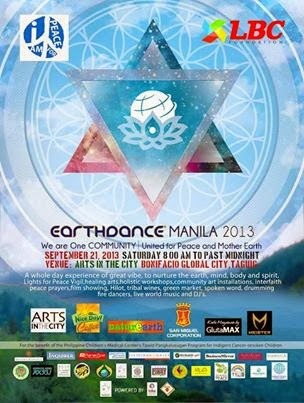 Earthdance Manila festival has partnered with associates in music, art, cultural and environmental movements, to come up with activities that nurture the earth, mind, body and spirit. The whole-day event would cover Interfaith Prayers, Earth Healing, Eco Wellness Workshops, Art & Culture Workshops, Synchronized Prayer for Peace plus a lot more! This one-day event on September 21, 2013 is for the benefit of the Philippine Children’s Medical Center’s Tawid Pangkalusugan Program for Indigent Cancer-stricken Children.